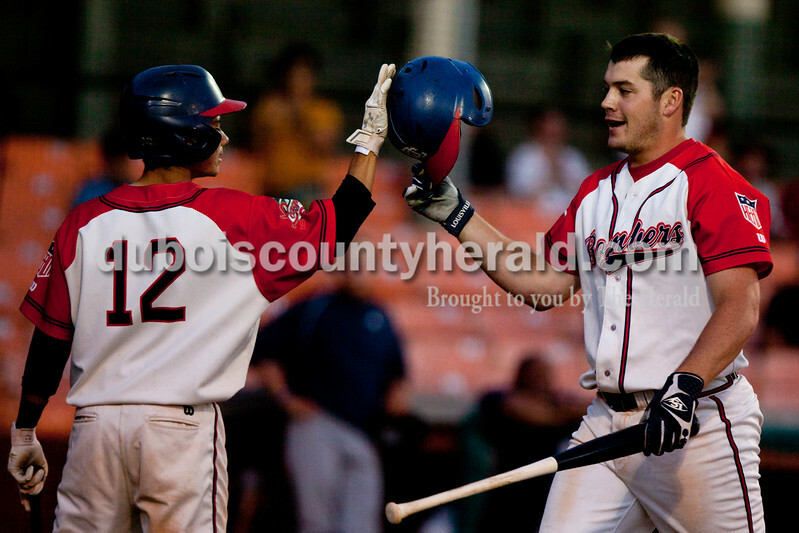 Dubois County Bombers' Roman Trujillo congratulated Brandon Smith after scoring a run during Tuesday night's game at League Stadium in Huntingburg. The Bombers defeated Paducah 8-2. 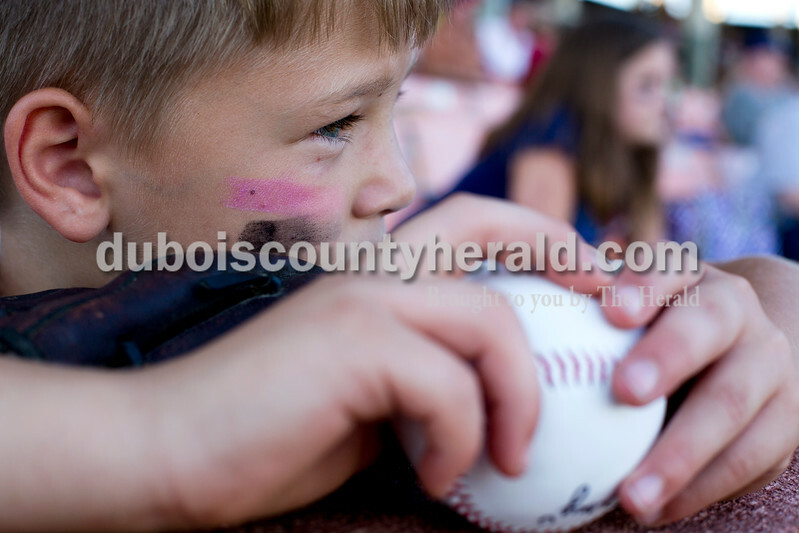 Elijah Dickey of French Lick, 8, held onto his signed baseball as he watched Tuesday night's game at League Stadium in Huntingburg. The Bombers defeated Paducah 8-2. 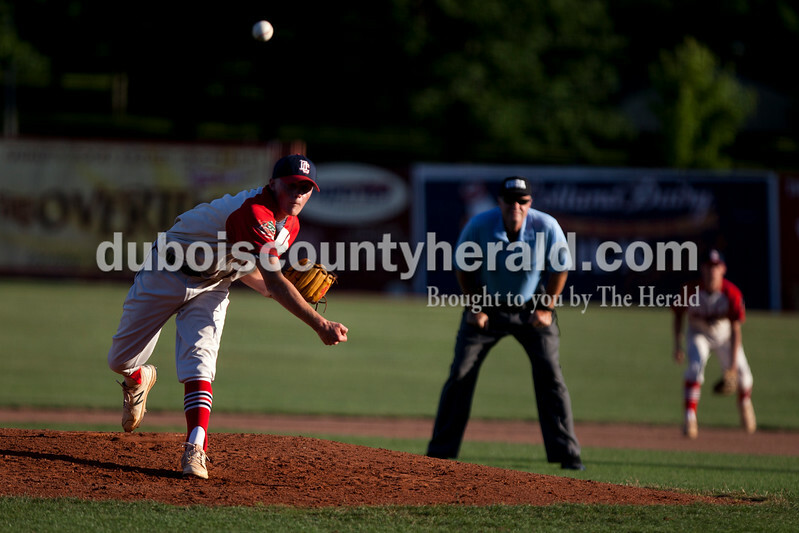 Dubois County Bombers' Chance Hitchcock delivered a pitch during Tuesday night's game at League Stadium in Huntingburg. The Bombers defeated Paducah 8-2. 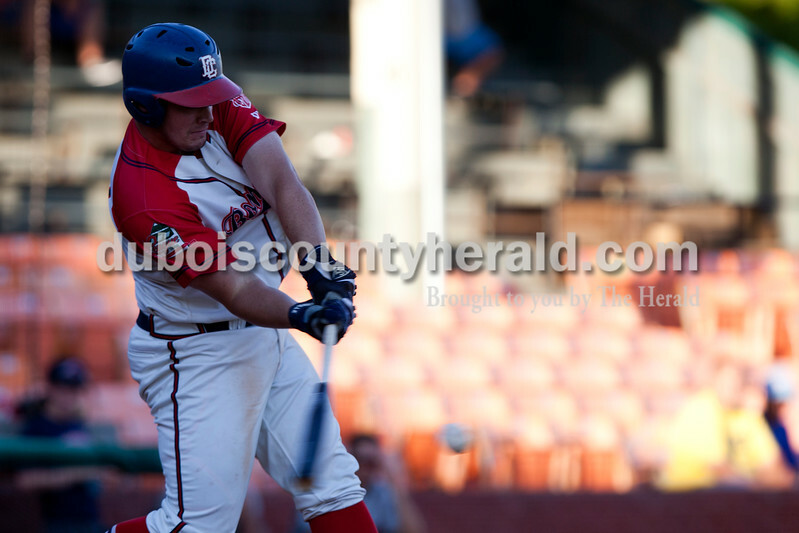 Dubois County Bombers' Brandon Smith swung to hit the ball during Tuesday night's game at League Stadium in Huntingburg. 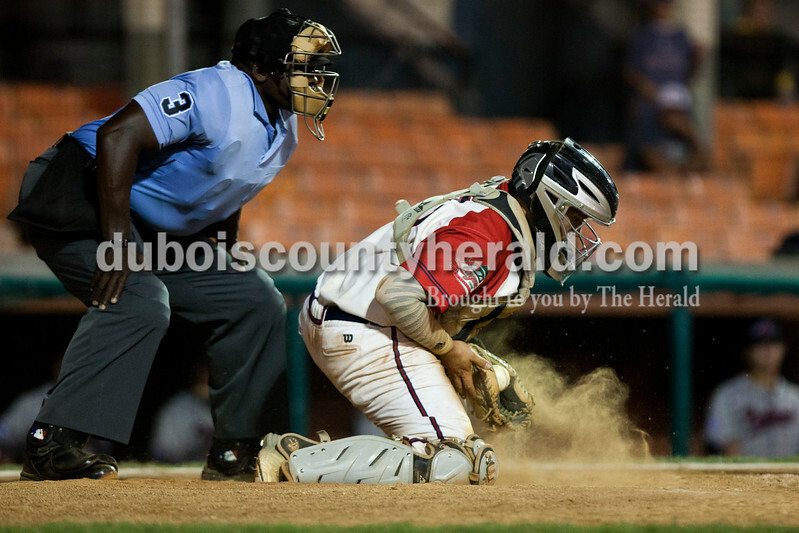 The Bombers defeated Paducah 8-2. 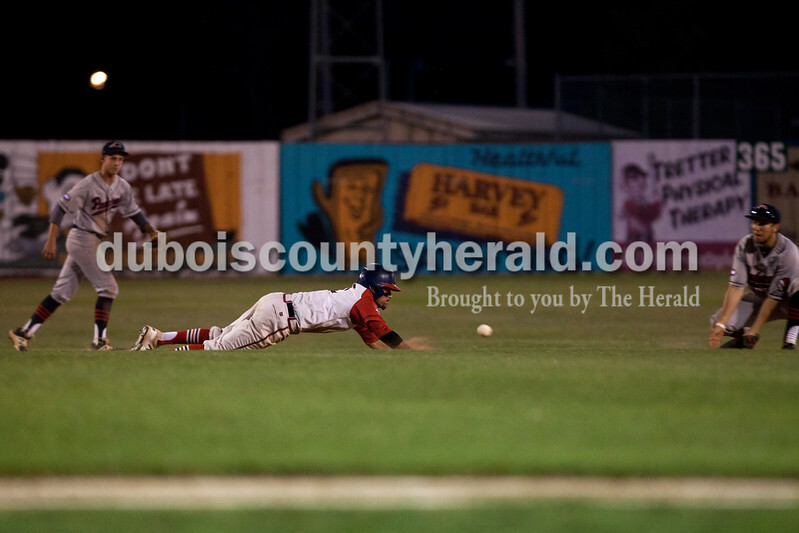 Dubois County Bombers' Jake Slunder slid safely back to second base during Tuesday night's game at League Stadium in Huntingburg. The Bombers defeated Paducah 8-2. 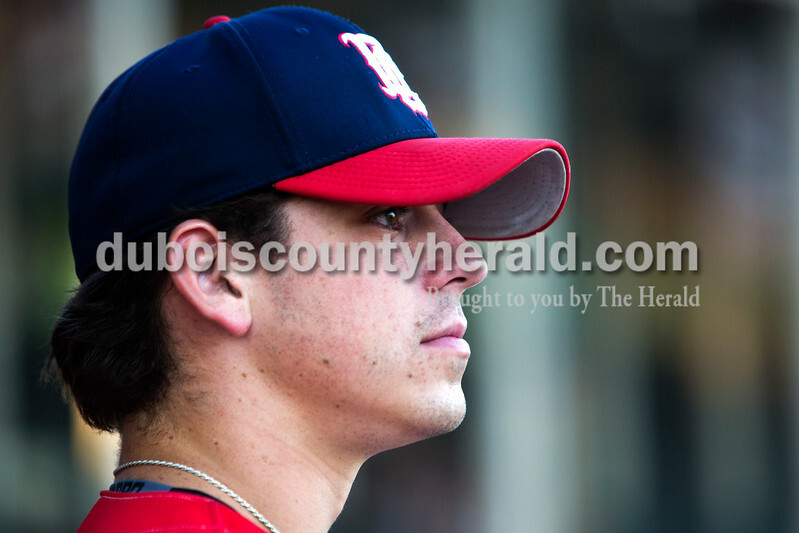 Dubois County Bombers' Trey Fulton caught a pitch during Tuesday night's game at League Stadium in Huntingburg. The Bombers defeated Paducah 8-2. Keyona Sharp of French Lick, 8, threw a water balloon at Kru Allen who was dressed as the mascot "Casey" during Tuesday night's game at League Stadium in Huntingburg. The Bombers defeated Paducah 8-2. 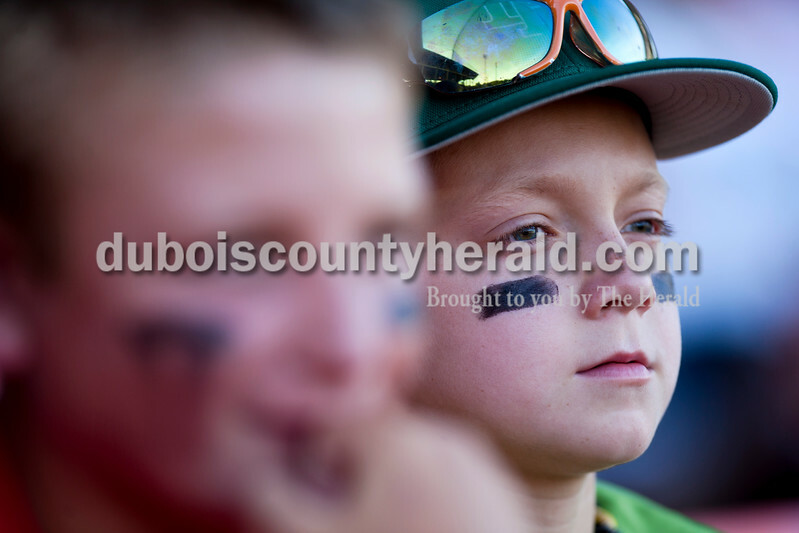 Andrew Verkamp of Schnellville, 10, right, watched the game with his friend Evan Haas of Schnellville, 12, during Tuesday night's game at League Stadium in Huntingburg. The Bombers defeated Paducah 8-2. 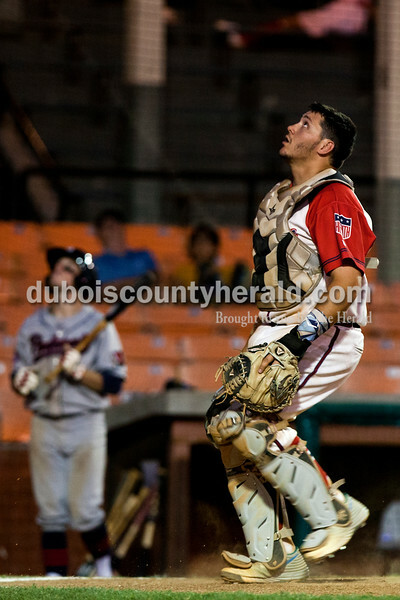 Dubois County Bombers' Trey Fulton ran to try to catch a foul ball during Tuesday night's game at League Stadium in Huntingburg. The Bombers defeated Paducah 8-2. 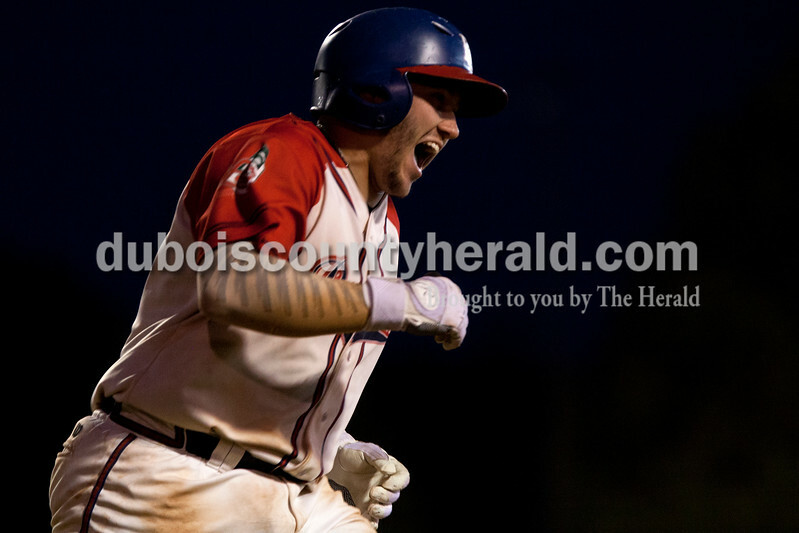 Dubois County Bombers' Trey Fulton ran to first base after hitting the ball during Tuesday night's game at League Stadium in Huntingburg. The Bombers defeated Paducah 8-2. 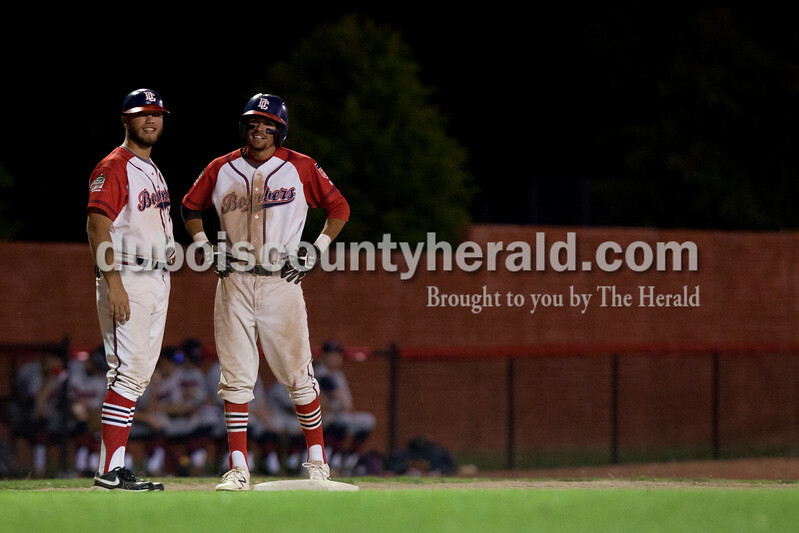 Dubois County Bombers' assistant coach Bryce Paxson talked to Jake Slunder at third base during Tuesday night's game at League Stadium in Huntingburg. The Bombers defeated Paducah 8-2. 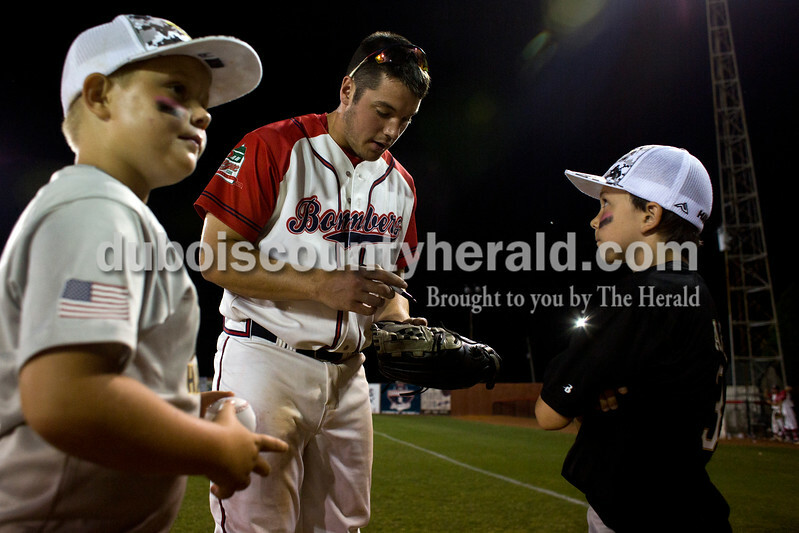 Dubois County Bombers' Brandon Smith signed a glove for Ethan Archer of French Lick, 8, after Tuesday night's game at League Stadium in Huntingburg. The Bombers defeated Paducah 8-2. 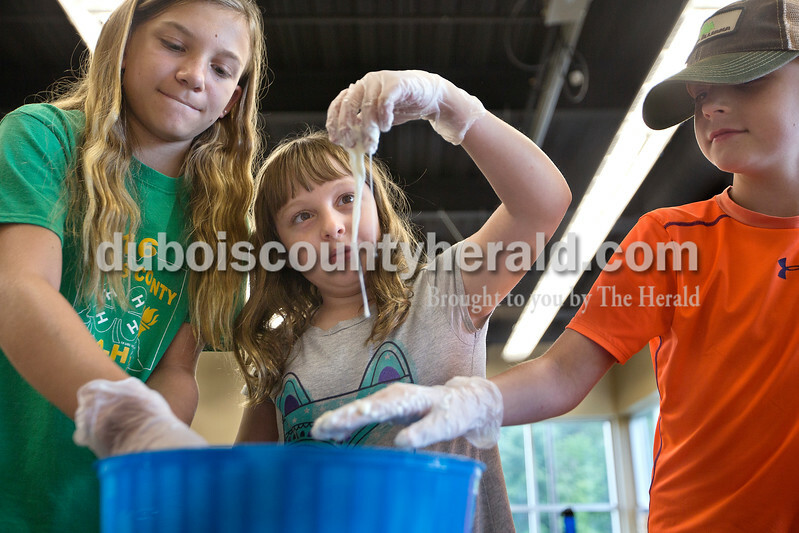 Ashlin Mehringer of Haysville, 11, left, Adonica Meyer, 9, and Mitchel Huebner, 9, both of Jasper, played with oobleck as part of Vincennes University Jasper Campus' Kids' College summer programming Ooey, Goey Creations and More Monday afternoon. 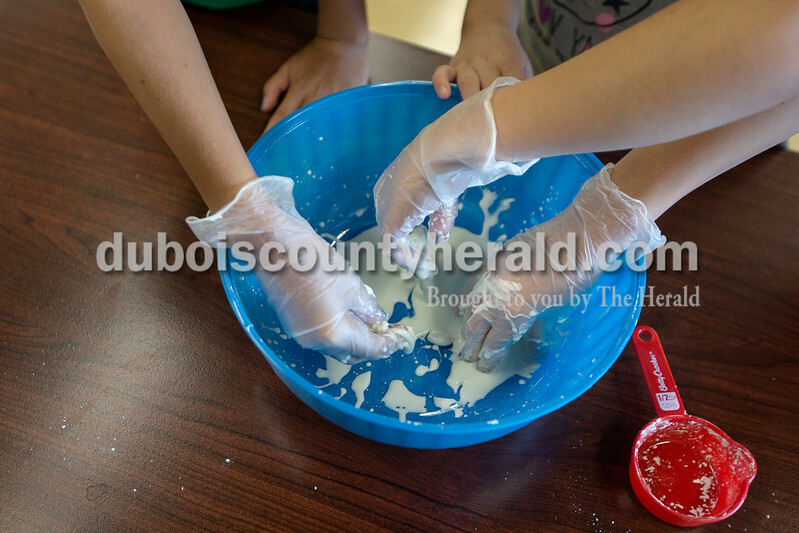 "It's like a solid and a liquid," Meyer said as she watched the oobleck slide down her fingers. Oobleck is non-Newtonian fluid made of water and cornstarch. 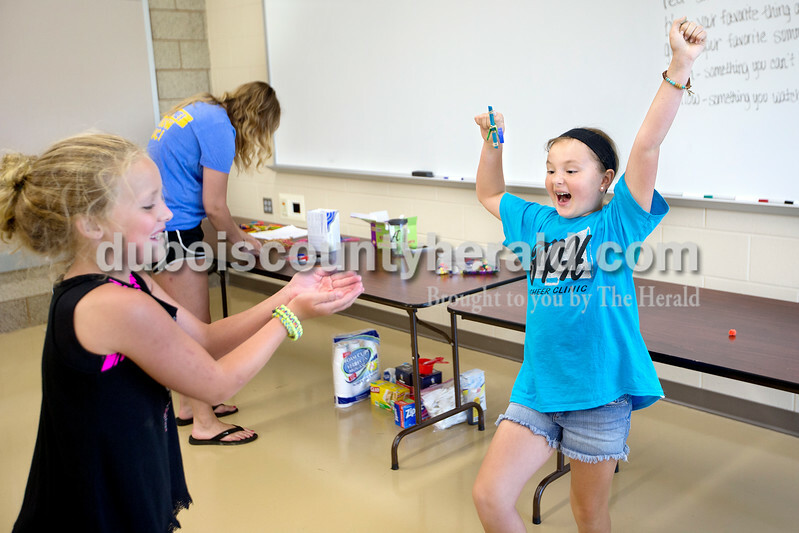 Leigha Nord of St. Anthony, 8, right, celebrated as Chloe Tooley of Huntingburg, 10, caught a puffed ball Nord launched from her catapult during Vincennes University Jasper Campus' Kids' College summer programming Ooey, Goey Creations and More Monday afternoon. 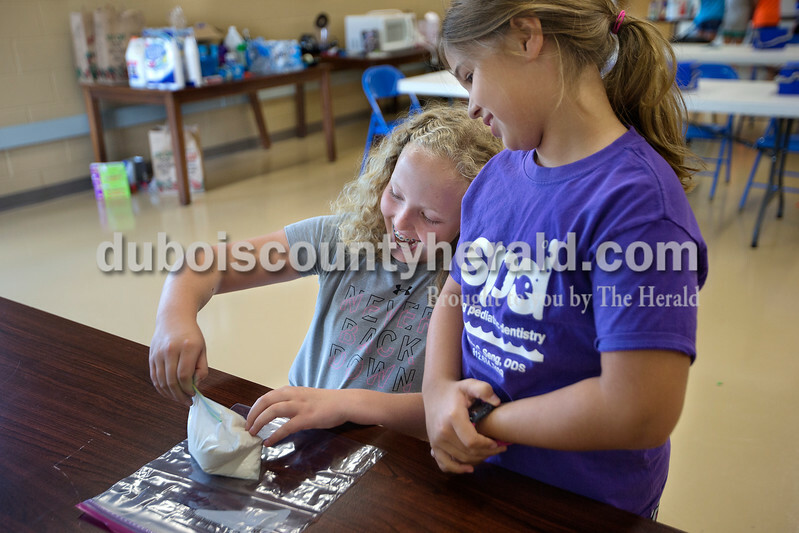 Program instructors Katelynn Schnell and Abby Rogier showed students how to make oobleck, ice cream in a bag and giant water beads. "We did a STEM class last year and this year we split the class into two, to give them a more hands on experience," Schnell said. Caroline Buechlein, 11, left, moved milk, sugar, vanilla extract and cream around in a bag as her sister Anna Buechlein, 8, both of Ireland, watched during Vincennes University Jasper Campus' Kids' College summer programming Ooey, Goey Creations and More Monday afternoon. After shaking the bag inside a second bag of ice and salt the pair created ice cream. Seventeen children ranging in ages from 8 to 11 participated in hands on Science Technology Engineering and Mathematics (STEM) activities throughout the afternoon. 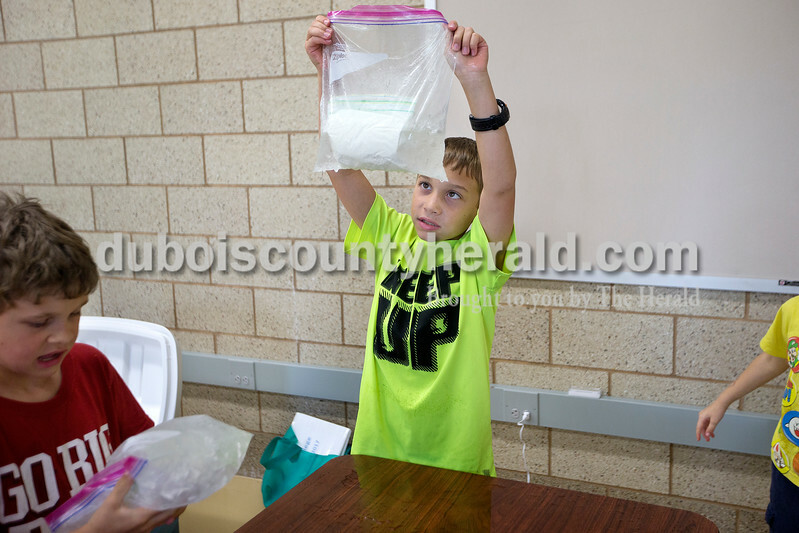 Paxton Mehringer of Haysville, 10, checked to see if his bag containing milk, sugar, vanilla extract and cream was leaking into the ice during Vincennes University Jasper Campus' Kids' College summer programming Ooey, Goey Creations and More Monday afternoon. Seventeen children ranging in ages from 8 to 11 participated in hands on Science Technology Engineering and Mathematics (STEM) activities throughout the afternoon. Ashlin Mehringer of Haysville, 11, left, Adonica Meyer, 9, and Mitchel Huebner, 9, both of Jasper, mixed water and cornstarch to make oobleck as part of Vincennes University Jasper Campus' Kids' College summer programming Ooey, Goey Creations and More Monday afternoon. "It's like a solid and a liquid," Meyer said as she watched the oobleck slide down her fingers. Oobleck is non-Newtonian fluid made of water and cornstarch. 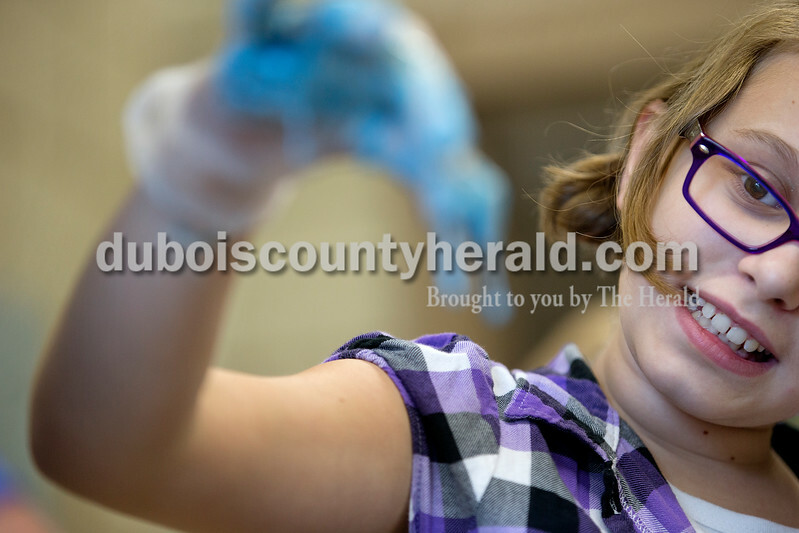 Addison Bolte of Ferdinand, 10, played with oobleck as part of Vincennes University Jasper Campus' Kids' College summer programming Ooey, Goey Creations and More Monday afternoon. Oobleck is non-Newtonian fluid made of water and cornstarch. 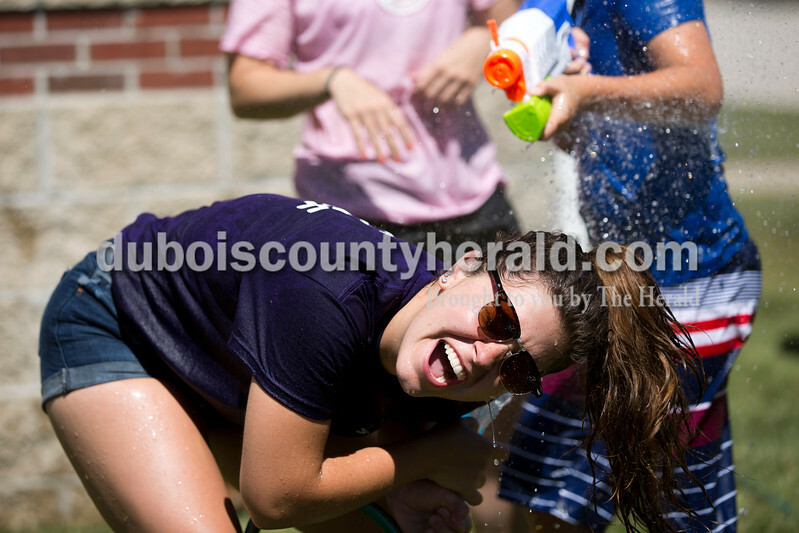 Rockford Peach Kayla Hoffman of Ferdinand was sprayed by Hayden Akpan of Ferdinand, 10, during Water Wars with the Dubois County Bombers at the Ferdinand Public Library on Tuesday. 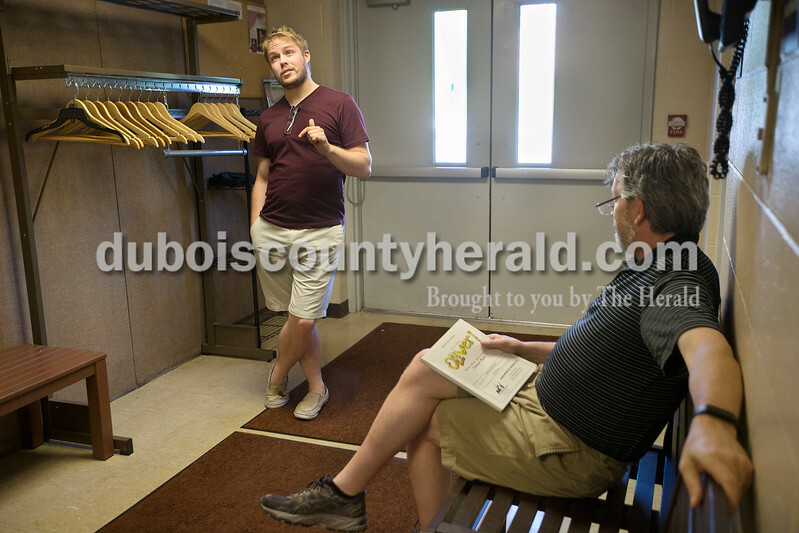 "Since everyone is from different places, it's good to get to know the people of Dubois County," said Bombers player Zack Gray. "We enjoy being positive role models for the youth. This is a really fun way to spend my summer," said Rockford Peach Shelby Klem. 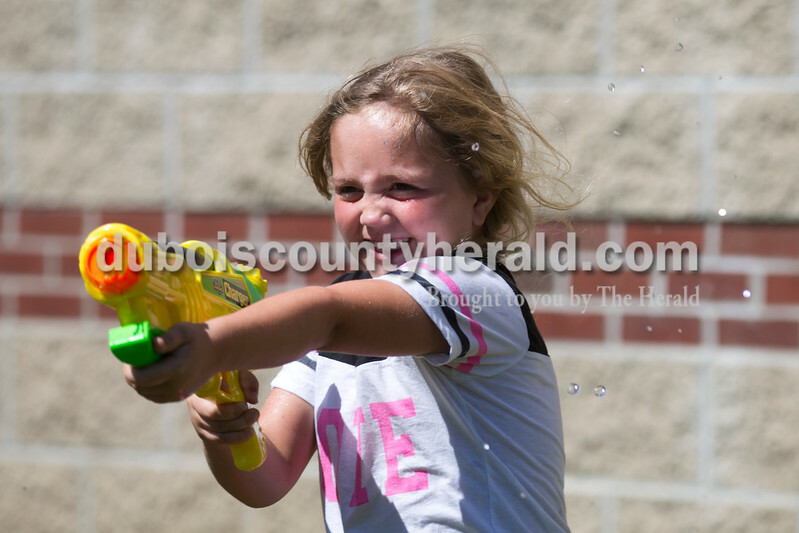 Rockford Peach Shelby Klem of Ferdinand tried to take cover as Owen Schuetter of Ferdinand, 10, sprayed her during Water Wars with the Dubois County Bombers at the Ferdinand Public Library on Tuesday. 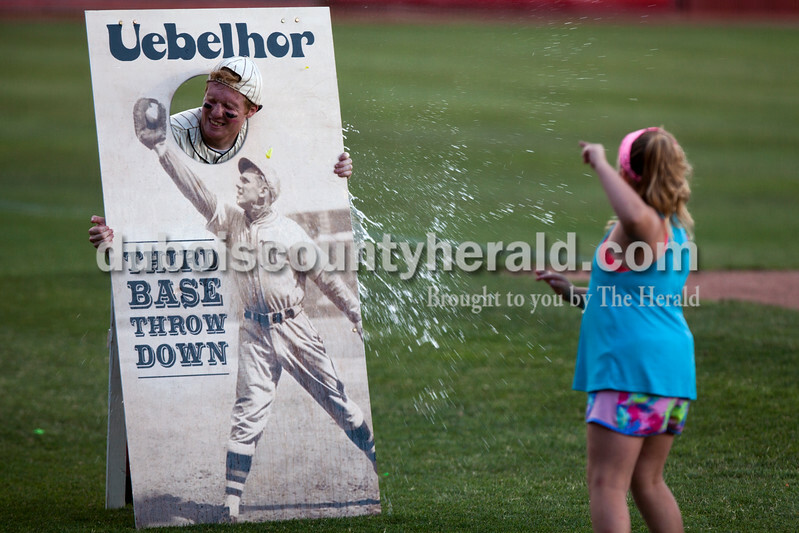 Rockford Peach Shelby Klem of Ferdinand, center, squirted Brooklyn Fleig of Ferdinand, 10, right, as Hayden Akpan of Ferdinand, 10, left, came from behind during Water Wars with the Dubois County Bombers at the Ferdinand Public Library on Tuesday. 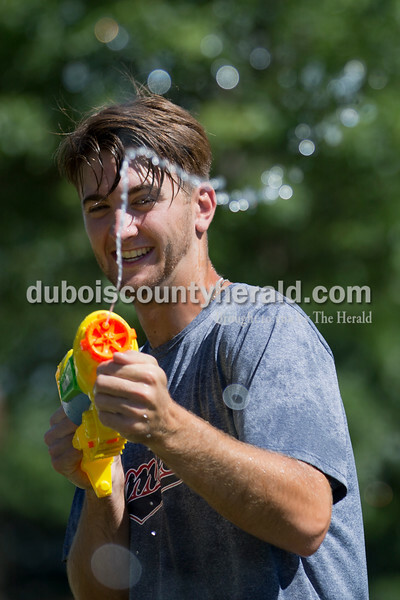 Dubois County Bombers player Joey Antonopoulos of Plainfield, Ill. fired a squirt gun during Water Wars with the Dubois County Bombers at the Ferdinand Public Library on Tuesday. 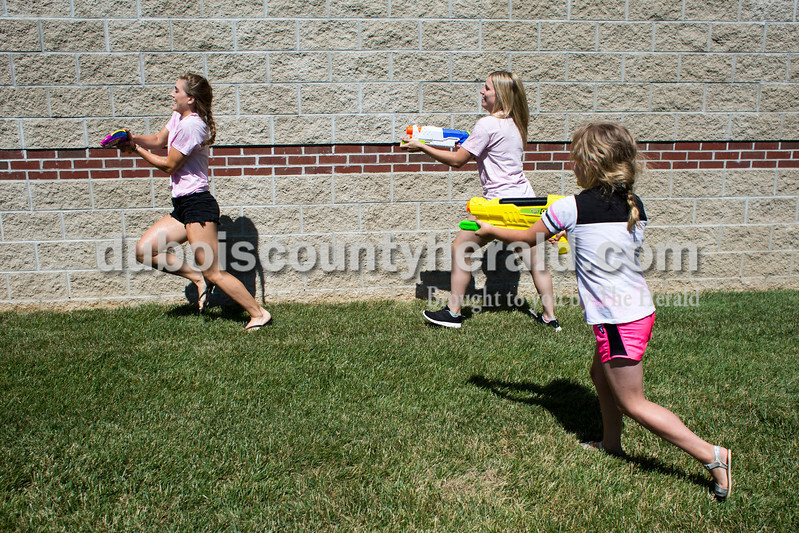 Rockford Peach Lauren Meyer of Ferdinand, left, was chased by Peach Kayla Hoffman of Ferdinand and Brooklyn Fleig of Ferdinand, 6, during Water Wars with the Dubois County Bombers at the Ferdinand Public Library on Tuesday. 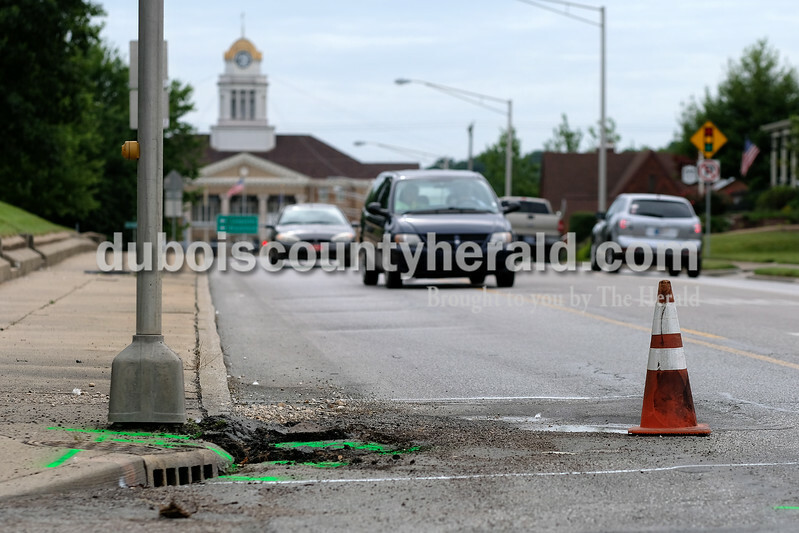 Brooklyn Fleig of Ferdinand, 6, shot her squirt gun during Water Wars with the Dubois County Bombers at the Ferdinand Public Library on Tuesday. 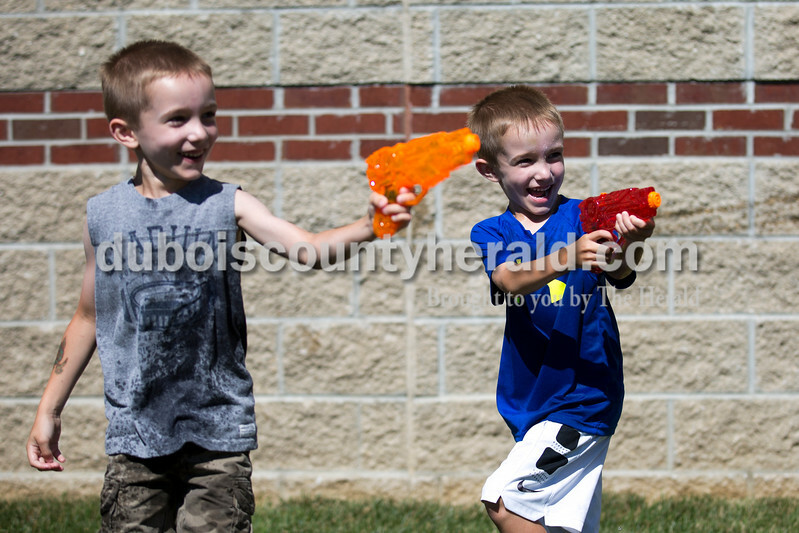 Five-year-old triplets Max and Parker Werne participated in Water Wars with the Dubois County Bombers at the Ferdinand Public Library on Tuesday. 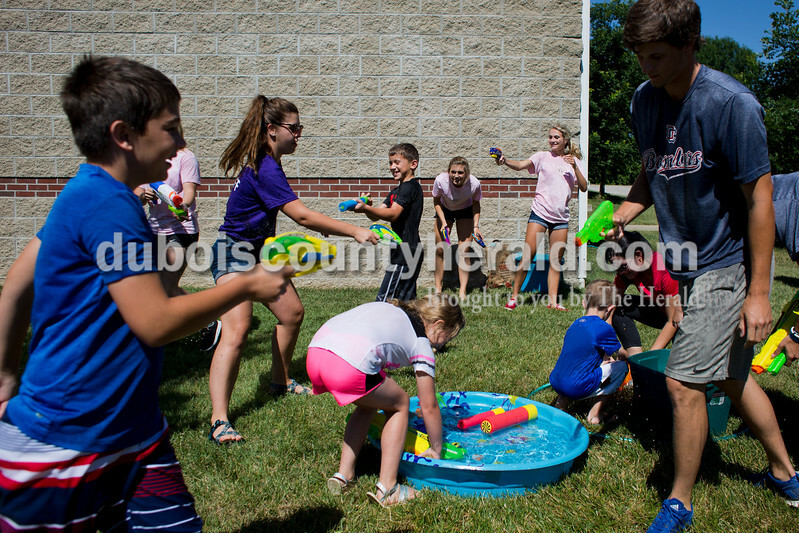 The library provided squirt guns for participants during Water Wars with the Dubois County Bombers at the Ferdinand Public Library on Tuesday. 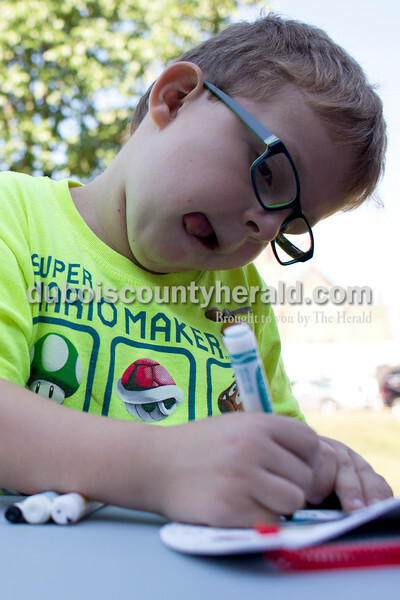 Waylon Barker of Jasper, 6, focused while coloring his visor during Wednesday's Outside Art Day at the Jasper Public Library. Families spent the morning working on a variety of crafts, which included coloring visors, making animal masks, decorating sticker sheets, painting and more. 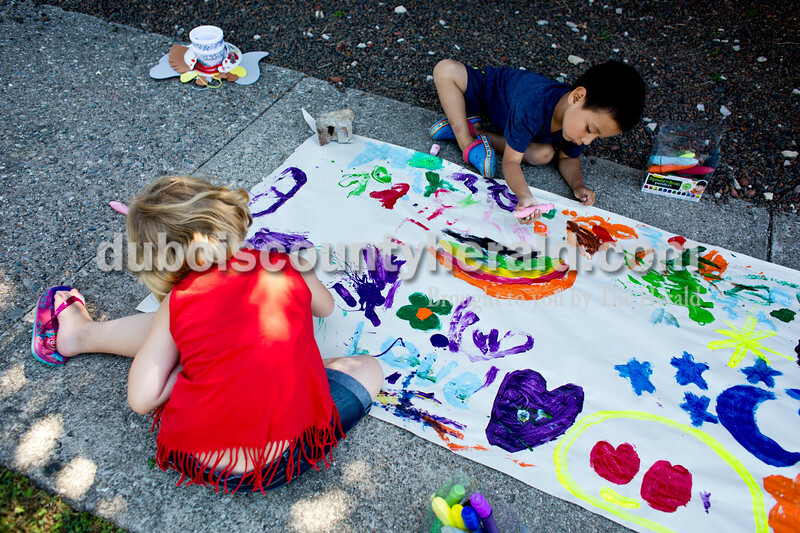 Daisy Barker, 5, left, and Gio Angeles, 4, both of Jasper, painted during Wednesday's Outside Art Day at the Jasper Public Library. Families spent the morning working on a variety of crafts, which included coloring visors, making animal masks, decorating sticker sheets, painting and more. 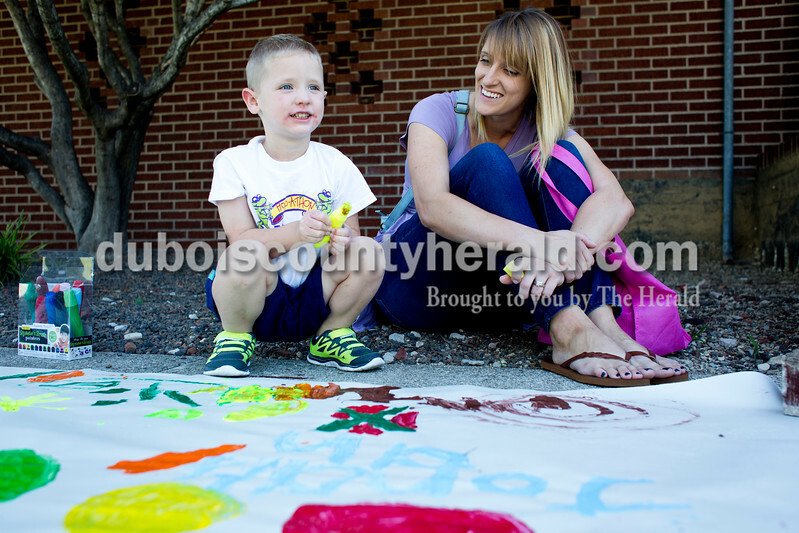 Amanda Smith of Jasper painted with her son, Henry, 3, during Wednesday's Outside Art Day at the Jasper Public Library. Families spent the morning working on a variety of crafts, which included coloring visors, making animal masks, decorating sticker sheets, painting and more. 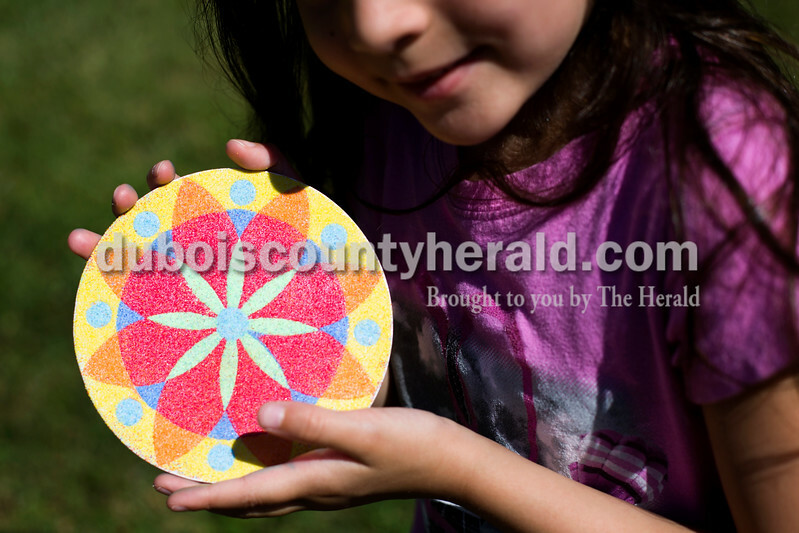 Raylee Bastin of Jasper, 5, showed off her craft she made with glitter during Wednesday's Outside Art Day at the Jasper Public Library. Families spent the morning working on a variety of crafts, which included coloring visors, making animal masks, decorating sticker sheets, painting and more. 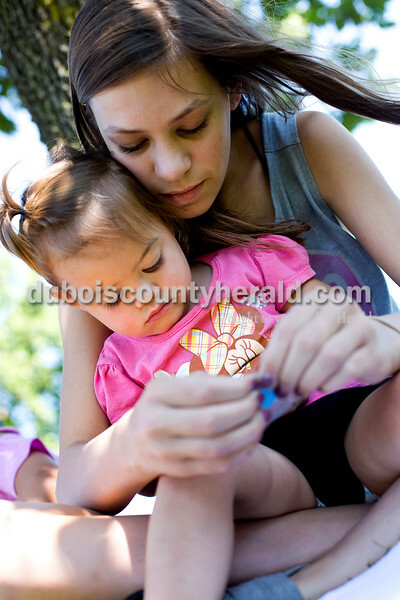 Faustina Lueken of Jasper, 14, helped her younger sister, Beatrice, 2, peal off stickers to decorate her sticker sheet during Wednesday's Outside Art Day at the Jasper Public Library. Families spent the morning working on a variety of crafts, which included coloring visors, making animal masks, decorating sticker sheets, painting and more. 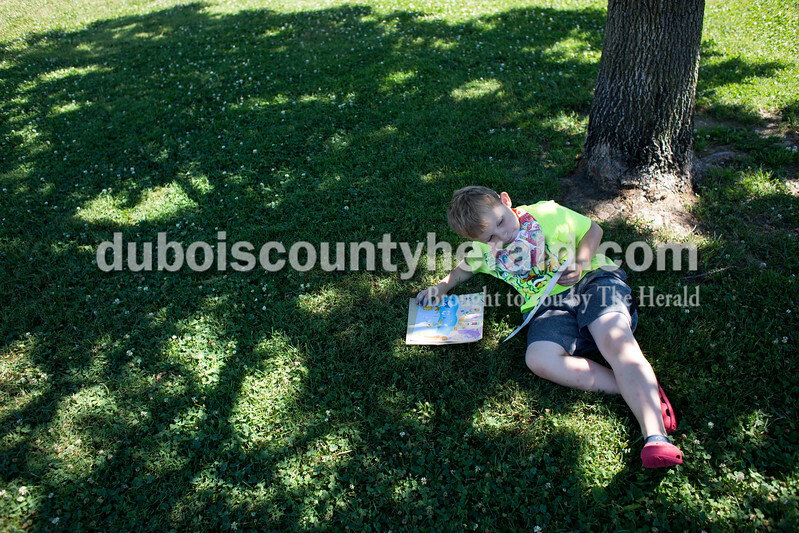 Waylon Barker of Jasper, 6, lounged under a tree while he decided what stickers to use to decorate his sticker sheet during Wednesday's Outside Art Day at the Jasper Public Library. Families spent the morning working on a variety of crafts, which included coloring visors, making animal masks, decorating sticker sheets, painting and more. 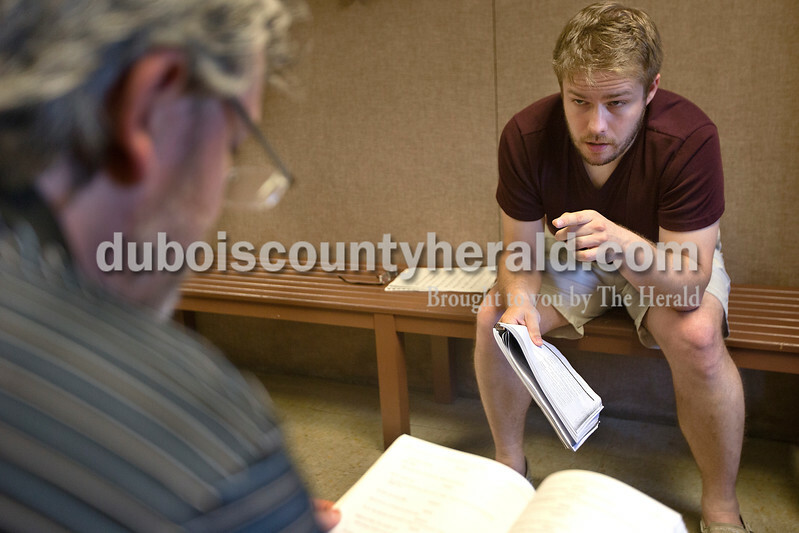 Director of the Jasper Community Arts Commission Kyle Rupert, left, practiced his cockney accent while reading through lines with Jadd Miller of Ferdinand at the Jasper Arts Center Tuesday evening. Rupert will be playing the part of Bill Sikes in the Actors Community Theater production of "Oliver!". "I'm usually cast as the good guy so it will be fun to play Bill," Rupert said. 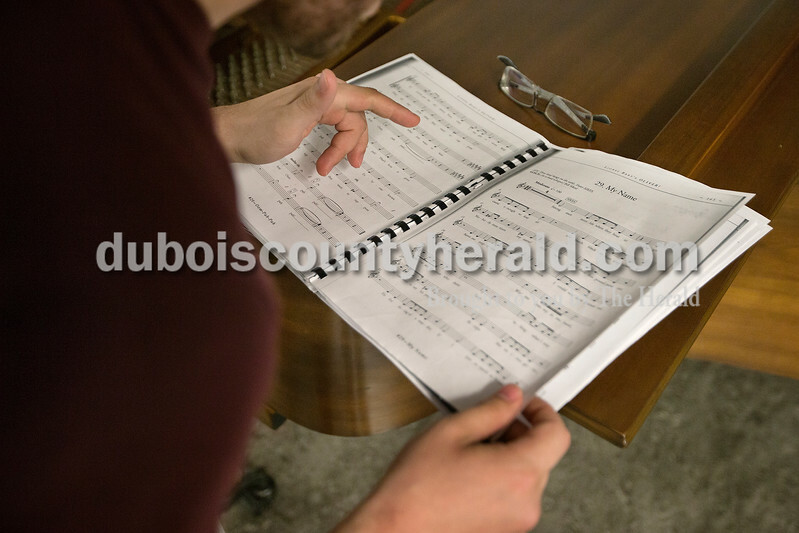 Director of the Jasper Community Arts Commission Kyle Rupert followed the music while he rehearsed for the Actors Community Theater production of "Oliver!" at the Jasper Arts Center Tuesday evening. Rupert was hired as the director on May 1 of this year. 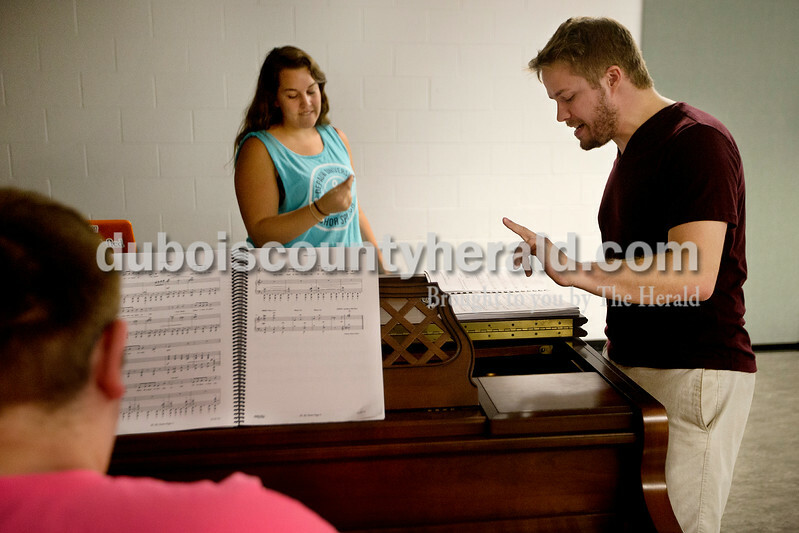 Actors Community Theater pianist Jonathan Kroger, left, Music Director Laura Witte and Director of the Jasper Community Arts Commission Kyle Rupert rehearsed a song from the upcoming performance of "Oliver!" at the Jasper Arts Center Tuesday evening.